Citation Information: J Clin Invest. 2007;117(2):314-325. https://doi.org/10.1172/JCI30062. Although ras is a potent mitogenic oncogene, its tumorigenicity depends on cellular context and cooperative events. Here we show that low-level expression of a constitutively active Ha-ras in mouse urothelium induces simple urothelial hyperplasia that is resistant to progression to full-fledged bladder tumors even in the absence of Ink4a/Arf. In stark contrast, doubling of the gene dosage of the activated Ha-ras triggered early-onset, rapidly growing, and 100% penetrant tumors throughout the urinary tract. Tumor initiation required superseding a rate-limiting step between simple and nodular hyperplasia, the latter of which is marked by the emergence of mesenchymal components and the coactivation of AKT and STAT pathways as well as PTEN inactivation. These results indicate that overactivation of Ha-ras is both necessary and sufficient to induce bladder tumors along a low-grade, noninvasive papillary pathway, and they shed light on the recent findings that ras activation, via point mutation, overexpression, or intensified signaling from FGF receptor 3, occurs in 70%–90% of these tumors in humans. Our results highlight the critical importance of the dosage/strength of Ha-ras activation in dictating its tumorigenicity — a mechanism of oncogene activation not fully appreciated to date. Finally, our results have clinical implications, as inhibiting ras and/or its downstream effectors, such as AKT and STAT3/5, could provide alternative means to treat low-grade, superficial papillary bladder tumors, the most common tumor in the urinary system. Expression of senescence-associated markers during urothelial hyperproliferation and tumorigenesis in UPII/Ha-ras-M–transgenic mice. (A–C) Expression of Ink4a gene products, p16Ink4a (p16) and p19Arf (p19), as assayed by real-time quantitative PCR (A and B) and Western blotting (C). n, number of animals assayed in each group; Normal, normal urothelia from wild-type mice; +/– S/HP, simple urothelial hyperplasia from heterozygous transgenic mice; +/– T, low-grade, noninvasive superficial papillary tumors from the heterozygous mice. The level of p16 and p19 mRNA is expressed as a ratio in reference to a simultaneously amplified internal control, GAPDH. Total urothelial proteins used for Western blotting (C) were extracted from wild-type mice exhibiting normal urothelia (lane 1); heterozygous UPII/Ha-ras-M–transgenic mice exhibiting urothelial hyperplasia (6 months old; lanes 2 and 3); and heterozygous mice exhibiting low-grade, superficial papillary tumors (15 months old; lanes 4 and 5). 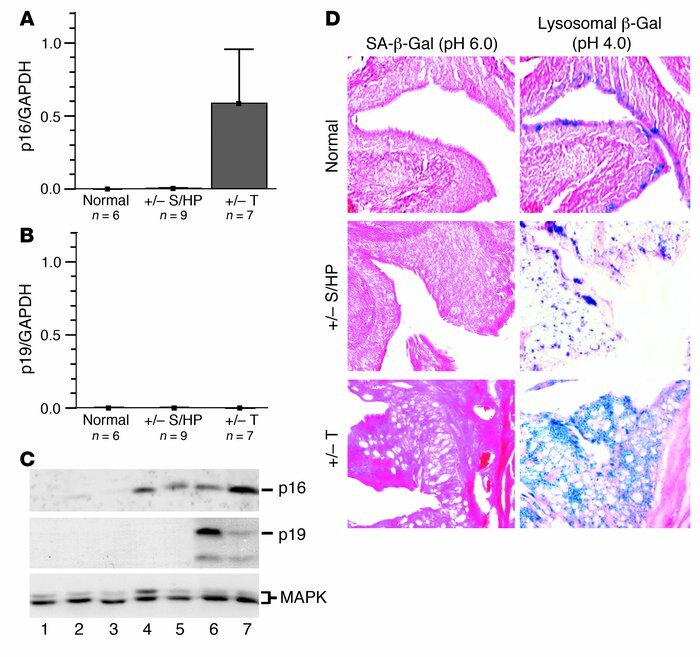 Urothelial proteins from UPII/SV40T-transgenic mice were used as positive controls for p16 and p19 antibodies (lanes 6 and 7). MAPK was used as a loading control. Note the marked induction of p16, but not p19, in ras-induced urothelial hyperplasia as well as in low-grade, superficial papillary tumors. (D) Histochemical detection of senescence-associated β-galactosidase activity (SA-β-gal; stained at pH 6.0) and lysosomal, non–senescence-associated β-galactosidase activity (adjacent sections stained at pH 4.0). Urothelial tissues were from wild-type mice exhibiting normal urothelium, heterozygous transgenic mice exhibiting simple urothelial hyperplasia, and transgenic mice exhibiting papillary urothelial tumors. Note the absence of senescence-associated β-galactosidase activity in all of the urothelial lesions. Original magnification, ×200.